Moorer-Cooper, Jefferson-Harris, Foreman-Lyle - is the brutal Whyte-Chisora scrap worthy of being ranked alongside these epic slugfests? Moorer-Cooper, Jefferson-Harris, Foreman-Lyle – is the brutal Whyte-Chisora scrap worthy of being ranked alongside these epic slugfests? Praise continues to come in, justifiable praise at that, for the quite incredible twelve-round slugfest British heavyweights Dillian Whyte and Dereck Chisora gave us on Saturday night in Manchester. Promoter Eddie Hearn called the give and take, two-way barnburner one of the best heavyweight fights he has ever seen. And this was not mere hyperbole intended to sell tickets – the fight is in the history books now. However, there could be a part-two – providing the two rivals who knocked lumps out of each other for the full 36 minutes of blistering action have the energy and the desire to go through such hell again – as victor Whyte said yesterday. As great as the first fight was, Hearn could pretty much go anywhere with a return clash. This time, though, Whyte Vs. Chisora will be, or should be, the headliner – and the two warriors should get paid more than they got paid on Saturday. 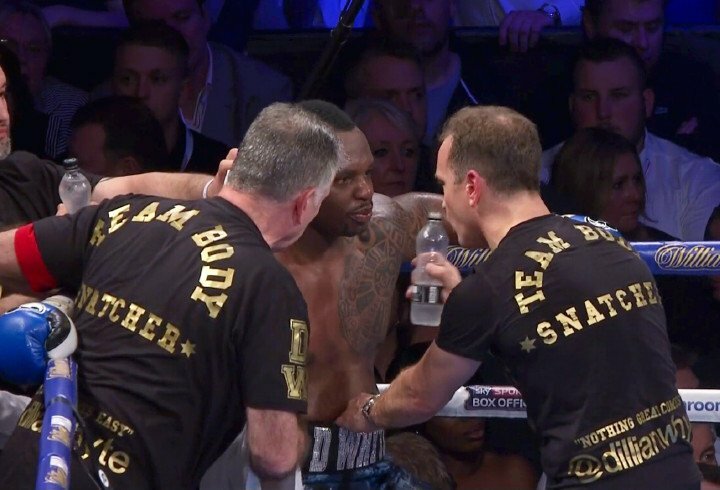 It was a great fight, the decision, that went to Whyte, proved debatable, and though the two embraced after their war, the grudge factor remains. Simply put, if the two fighters can stand it, a rematch is a natural. Right now, however, fight fans can sit back and watch this heavyweight battle, one that brought back memories of the special ones, over and over again (four views already here and counting!). Only the passing of time allows a fan to properly rate the merit of a fight but this one does seem worthy of being ranked right up there with the likes of Michael Moorer’s knockdown-filled rumble with Bert Cooper, Derrick Jefferson’s jaw-dropping warfare with Maurice Harris, even with THE benchmark fight for heavyweight slugfests, George Foreman-Ron Lyle. Amazingly, there were no knockdowns in Whyte-Chisora, but the pure brutality and the non-stop action floored many a boxing fan. Who came off worse in the war, Chisora or Whyte? Whoever has the most left – and that would seem to be the winner, although many fans felt that distinction should have gone to Chisora – should win the return. But in no way will it be easy. You are here: Home / Boxing News / Moorer-Cooper, Jefferson-Harris, Foreman-Lyle – is the brutal Whyte-Chisora scrap worthy of being ranked alongside these epic slugfests?